Given its scope, it’s tempting to call this exhibition A Working Model of the Universe, but curators, Dr Lizzie Muller and Holly Williams have humbly limited themselves to “the world.” Covering the top floor of the UNSW Gallery, this is a big exhibition made from more than 32 little things, including historical artefacts and prototypes, architectural maquettes and artistic renderings of the model manifested as painting, photography, sculpture and video. The curators are interested in how the model as microcosm can offer insights — practical, theoretical, spiritual — into the macrocosm. They have structured the exhibition around a number of non-exclusive classifications: the model as ideal, as proof, prediction, simulacrum; the model as an edifice of scale, an expression of a belief system, a step in the creative process or a tool of mastery. These provocations make for rich ruminations on works that concretise the speculative and speculate about the concrete. Easing us into the exhibition are the kind of models we first expect — those of the built environment. Ten iterations of the Bondi Surf Club made for architects Durbach Block Jaggers show the building’s concept developed within a contemporary and commercial reality. Richard Braddish’s Sydney’s Tallest Buildings 1:1000 (Excluding Spires) 1788–2017, shows us the historical evolution of a city. 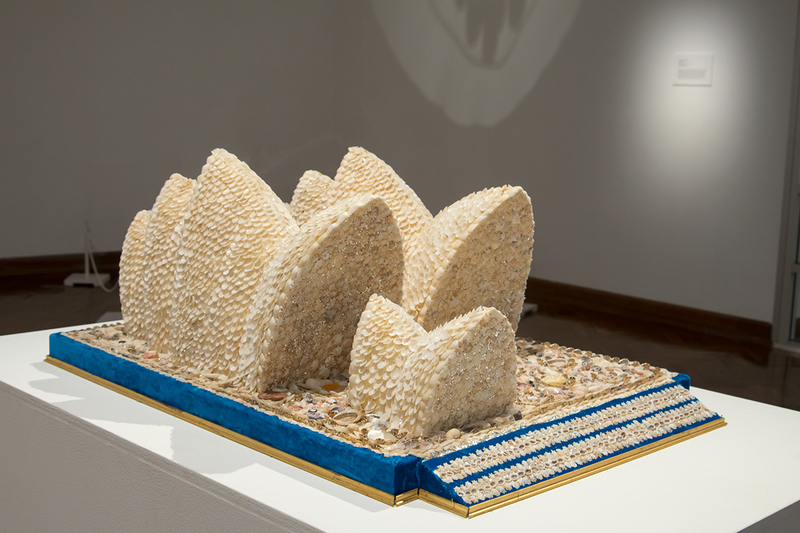 The centrepiece is Bidjigal artist and elder Esme Timbery’s intricate shell-worked renditions of the iconic Sydney Opera House and Harbour Bridge: a model as a fusion of cultures and a quiet and delicate statement of reclamation. A darkened gallery to the right offers a cornucopia of wondrous and disturbing pieces, beginning with a kinetic work from Ian Burns titled Model Of A Model Of The Spread Of Ignorance. Small baby-monitors show still images of Donald Trump’s pursed lips and raging open mouth. The mechanical action of cogs and motors, adorned with cut-outs of Trump’s eyes, activates vision-switching to create a primitive, glitchy animation of this iconic ever-flapping orifice. The seemingly ad hoc, found materials smack of poverty — a poverty of thought, a poverty inflicted by ignorance — but also, in Burns’ artwork, a poverty that has bred ingenuity. Jo Law also uses lo-fi kinetics and aesthetics to great effect. Across 10 tiny dioramas she maps out “some useful values” as presented by a high school chemistry textbook of scenes that incorporate what she calls “a set of values denoted by powers of 10.” With homemade electronics and cut-out images, the small boxes illustrate lightning moments of scientific discovery: light refraction, the invention of electricity, putting a man on the moon, the infinitesimal world of blood vessels. These tiny, ostensibly naive handcrafted pieces display a haunting fragility in their endeavour to explain the wonders of an enormous and baffling universe. Upping the scale somewhat is Brook Andrew’s Tombs Of Thought: Water, reminiscent of a hot air balloon. An inflatable world is turned upside down and anchored by a glass and wooden structure, which at first appears to be a vitrine. Peering in, however, we see a series of nestled, ever-smaller boxes, whose interior angles are obscured by reflections from glass and mirrors. Though our line of sight is blocked, the structure’s Babushka-doll nature becomes apparent when viewed from the outside — the fine blond wood boxes of decreasing size offset by similarly diminishing legs of charred, lumpy timber. It is an obtuse and thought-provoking artefact, meticulous crafted. Deftly placed among the speculative artistic models are a number of museum pieces that are no less artful. The Orrery, a 19th century mechanical model of the solar system, is particularly lovely, but its beauty is surpassed by the Avogadro Project Silicon Sphere, one of the roundest objects on Earth. This glistening ball of almost pure silicone was designed at the CSIRO as part of the international project to redefine the model of a kilogram as a specific number of silicone atoms (currently defined by a cylinder of platinum-iridium kept in Paris that is in a gradual state of decay). It is, without doubt, one of the most beautifully pure objects you can ever lay eyes on. So round and reflective is it that you feel your eyes constantly sliding off it. It is a model of an ideal, an object that defies entropy and seeks a level of perfection that is antithetical to the messy workings of the world — and it is utterly beguiling because of this. 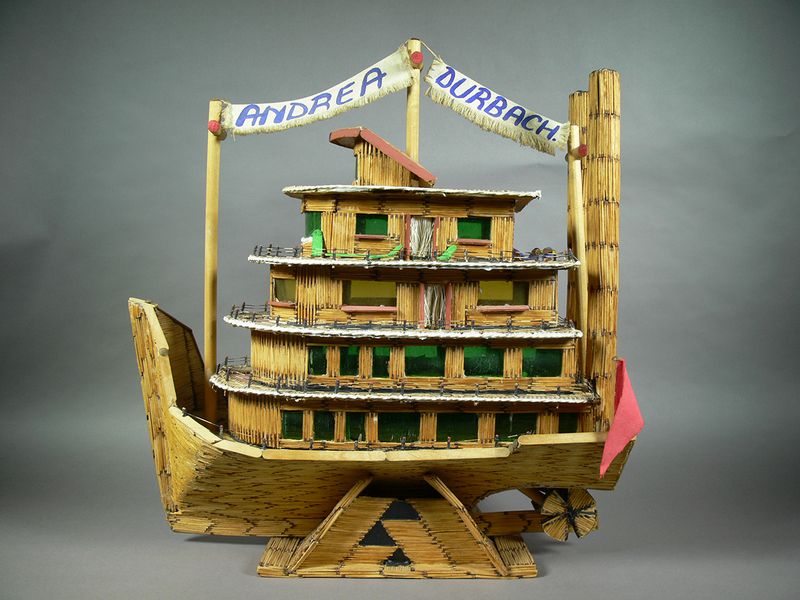 But for me the most affecting model is the Matchstick Boat by The Upington 25 on loan from lawyer and Human Rights campaigner Andrea Durbach. The model boat was created by a group of men and women falsely accused of murdering a policeman in 1988, during Apartheid in South Africa. Painstakingly pieced together from matches, the prisoners presented it to Durbach, their defence lawyer, during the trial. The Matchstick Boat is a deeply moving example of the power of hope that can manifest in a model. This sense of hope underlies nearly all the works in A Working Model of the World. The model is generally built before the real thing — be it object, building or world — and thus allows for so many possibilities. At the point of making a model we are still gods, or alternately still children tinkering with our doll’s house. Either way the possibilities gradually get shut down as the pressures of the real world take over, as the true scale of the enterprise exerts its power. But it is this sense of inspiration and aspiration, in the face of the harsh practicalities of actualisation, which make A Working Model of the World a thoroughly thought-provoking and quite magical exhibition.